Easy-to-use Explorer-like interface allows you easily to navigate through audio files on our computer and perform all actions just by one mouse click even for non-proficient users. In case of mass conversion you can use inbuilt Batch Conversion engine to performance. You just need to add files you want to convert to Batch Queue and ress "Process tasks" button! You can easily change conversion settings(output format,settings, ID3 Tag information) of tasks in Batch Queue, after you add them. Audio formats conversion is performed directly, without any temporary WAV files. This fact means higher converting speed and economy of hard disk resource. Fast processing speed saves your time and high conversion quality allows you really to enjoy your digital audio. Our digital audio converter uses most modern and fast audio codecs.IT internally supports WMA 9 format: WMA 9 with constant Bitrate, quality based WMA 9 format with variable Bitrate, two-pass Bitrate based WMA 9 format with variable bitrate and WMA 9 Lossless format, which allows you to store your digital audio with best quality. 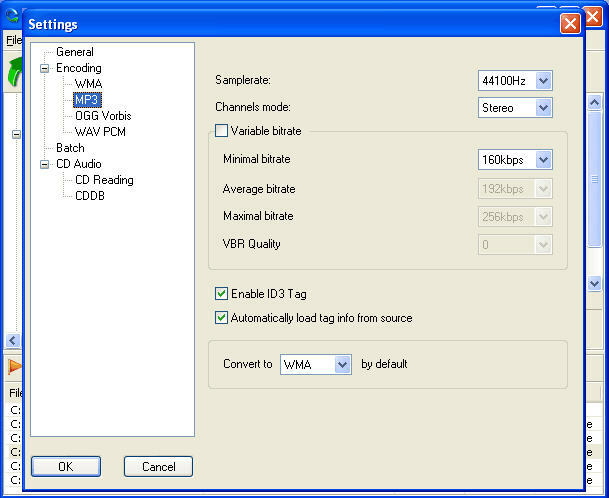 For MP3 encoding it uses fast LAME encoder 3.93, for OGG encoding it uses latest Vorbis SDK updates. 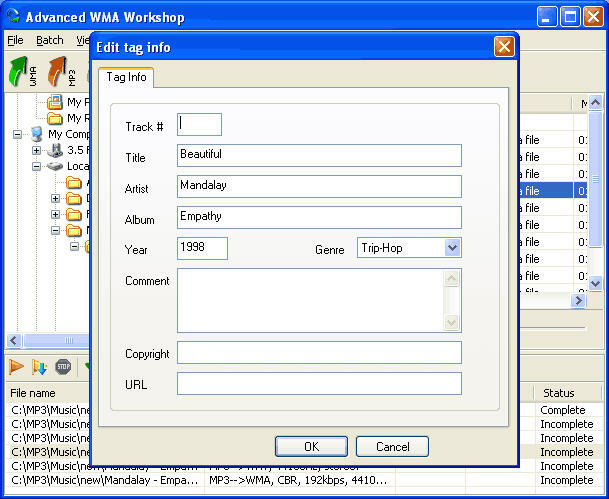 Program supports ID3 Tag v2, you can easily transfer all most useful tag fields from one format to another, edit these fields in audio files (multiple files tag edition is also supported). You can fastly and naturally transfer Audio CD tracks directly to any of WMA 9 format, OGG Vorbis, MP3 or WAV PCM format, using jitter correction to compensate reading errors. You can download information about Audio CD disc such as Album's and Artist's name, track's names, etc. from Internet database just by clicking on CD drive icon in Folders Tree. Saving and loading of CDDB information using Local CDDB base is also supported. 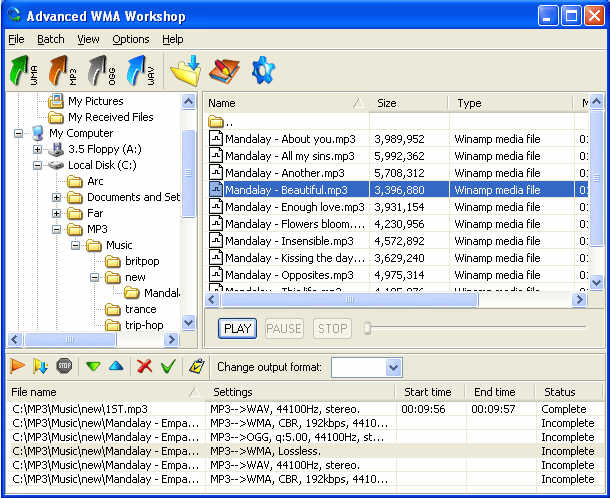 convert MP3, WMA, WAV and OGG to MP3, (CBR, VBR or ABR), WMA 8, WMA 9, WAV and OGG. 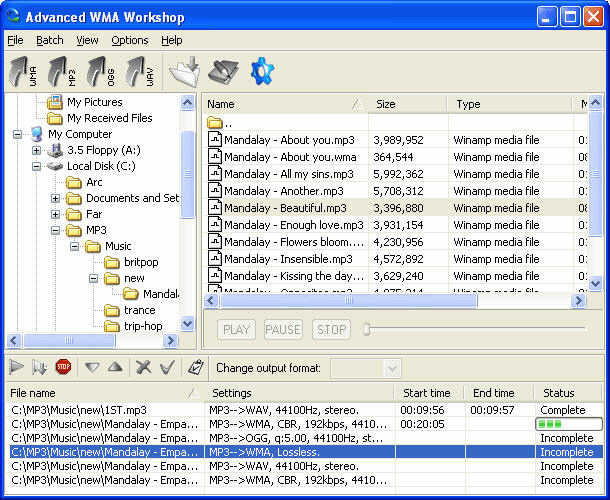 Convert MP3,WMA to WAV or from WAV to MP3 . Exports to MP3, WMA, ADPCM, DSP, MP2, VOX, OGG, GSM, G721, G723, G721 and A-LAW. MP3 to MP3, WAV to WAV, WMA to WMA, OGG to OGG, and supports MP3 VBR, OGG VBR.